Re: Why is the Custom Picker SelectedItem always wrong? delivers the right value sometimes, but mostly not. Add some debug code to your picker to see what values it is dealing with. Use your debugger to step through the code and see what is happening when the result is incorrect. I tried a lot of things. Is it possible to access this method again? You assign test only in the GetView method. This is the method that is creating your view. Normally, you would change the value in the Selected override. the formatting gives a space in on either side of ' . how to rectify it. With no idea of how your code works, or what HTML it generates from what input, we would have to guess - and that's a poor idea in development! Knock up a tiny DOCX file that shows the problem, convert it, and show both the input and output files as source, along with the source code you used to convert it. Then we stand a chance of being able to help you! WindowsMediaPlayer fullscreen does Not detect keydown's ! From all I could find, the solution is to use win32 API. i get this error: "...does not implement interface member..."
Now what? How to proceed? The link you cite should help you understand the messages you need to handle; also, see: [^]. You're getting down in the plumbing with this: it's liable to be tricky; a given COM component may, or may not, behave like others. thank you mister BillWoodruff and HNY2019. I run over that link you give me too. But now that you specifically mention it, i tried that code and i dont get the error anymore. Thank you very much. All I can say is that the underlying COM stuff we're still using (often, like the built-in WinForms Controls, wrapped in a shiny .NET API, with a GUI stuck on it) involves a lot internal, highly complex, architecture, and heavy use of the lowest level Win OS facilities. Check out the history of COM: Component Object Model - Wikipedia[^]. Whether you should "go deep" into the plumbing ? To really respond to that, I'd need to know a lot more about you, and your goals. hmmm, but in the same time i dont like your answer. Because i want to know what are the possibilities using it. What is used for most of the time? Is it even used anymore? I suppose, all the great softwares, like Visual studio's, 3dsmax, etc they all have at some point some naked plumbing win32 stuff in them that is not possible to make in any other high level languages. I am guessing here, big time. I am asking about all of these. I am not at all pertinent, im just a rookie (with high hopes in a greater, shinier future). Do you want to learn dinosaur dentistry and be unemployable until Jurassic Park is a reality, or, do you want to be a general practitioner ? Do you want to build your own car from parts, or fix one that is drive-able now ? If You use Visual Studio, when You extends from Interface, You can use Quick Action to implement the interface function. Click the bulb icon (Ctrl+. 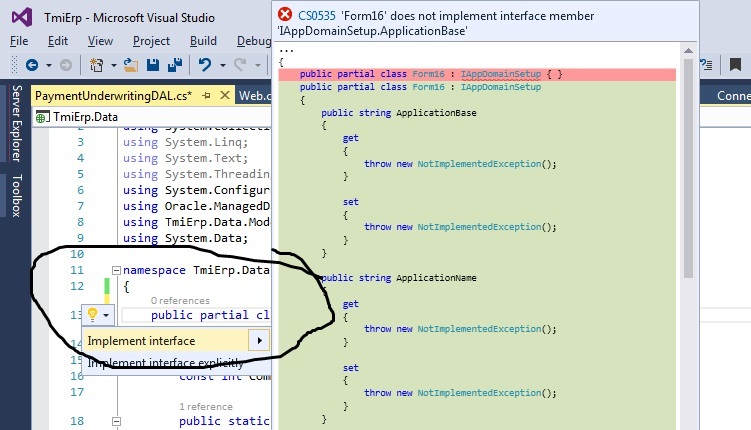 ), and choose Implement Interface..
Interface need to declare interface function(s) at the child, and the parent does not declare yet the body of interface function. How to clone a videoPlayer trackbar? First of all, HNY2019 to codeproject comunity. You are doing a very good job! I am learning how to use WindowsMediaPlayer control. My (new) track bar is a fixed length (200px) Empty control with a Paint red rectangle inside it, that updates videoplayer Current time. I am stuck at a strange point that i cant manage to see the solution. I bet is a simple solution and i am too tired and foggy to see it right now. The problem is the Maximum Length of the Movie. It is changing every time when i load a new movie, right so far? Now, my fixed track bar has 200px. How do i make 200px into 1600 int length? So sorry for my bad english explanation. Basically, i want to clone a videoPlayer trackbar. Re: How to clone a videoPlayer trackbar? You're not cloning anything. All you're doing is mapping a number range onto another number range, or a simple percentage. Your trackbar simply goes from 0 to 100%. This is grade school math. At 200 pixels wide, each pixel represents 0.5%. When your video is playing, you get the percentage played by dividing the number of seconds played by the total number of seconds in the video. You'll get a number between 0 and 1, your percentage played. put an example there too please. It's simple. You played 1200 seconds of a 1600 second video. That's 1200/1600 = 0.75, or 75% of the video played. Your trackbar is 200 pixels wide, for 100%, so each pixel represents 0.5%, or put another way, 2 pixels represents every 1%. So, you draw your marker 75 * 2 pixels over from it's start. Thank you mister Dave Kreskowiak - very nice answer! Simple: each pixel in your trackbar represents a variable amount of time: 0.5% of the total length of the movie. So if your movie is 55 minutes and 37 seconds long, each pixel represents (55 * 60 + 37) * 0.005 == 16.685 seconds. I forgot a very old and very useful rule... heh. All good now. Thank you. another devil now - with progressBarX1_Click. I wish i can Delete this thread. The "delete" link Button from the top, is showing this time(Haleluia), but is greyed out and I can not use it. Probably is a thing for those with money. I am thinking too much probably. But seriously, this is a ... (my) fart thread, that i wish to smudge it. No, it's simply that you can't delete any post with a response: it would leave the response "hanging in midair" with no support, screaming and wetting itself in terror (Posts are scared of heights, as I'm sure you know). And of course you have no authority to delete other peoples posts, so you can't get rid of it! I have a WSDL provided by a third party supplier that i would like to use in my C# code however currently i'm struggling to find a way to use the WSDL. I looked at their example and they're using ASMX file in the C# project in order to invoke the methods exposed by the service. If i wanted to use methods available in the WSDL in the C# project, how do i import the WSDL into the project? The obvious answer is, talk to the supplier. Yes thats right. Sorry i didn't make it clear. What's the correct way of importing the WSDL into the C# project? Is it using Web Reference or Service Reference?